Will You Be My… Volunter? Often, we don’t realize how powerful our actions are and how they can affect others. Everything we say or do has an impact on those around us. Isabelita Rosueta Organization (#IROG) encouraged students to participate and promote the National Bullying Prevention Month last October – an awareness campaign spearheaded by TR Button Buddies and Rhemus Graphics to keep students of Sto. Tomas Elementary School safe from bullying. Spreading the word through button pins were distributed to the students to inspire everyone to help create a community without bullying. And to Marjie Myrtle Marmito for the awesome button pin designs! Racquel Tuazon, Riselle Cha Tuazon Asuncion and Charmaine Rose Barredo Gallaron for the student engagement and conversation to educate, inspire and support! Before you say or do something, think about how you might make others feel. Spread kindness, spread LOVE. We would like to Take a Stand, Lend a Hand for We Rise by Lifting Others. In celebration of the National Bullying Prevention Month last October, Isabelita Rosueta Organization participated through the help of TR Button Buddies in the production of button pins. Hakab na Olongapo is on it’s 4th year of celebrating and educating mothers from Olongapo, Zambales and Bataan, the importance of breastfeeding. Isabelita Rosueta (IROG) Foundation joined the activity last August 4, 2018 at Harbor Point Activity Center. Ready to assist the participants and be part in spreading knowledge about the significance of breastfeeding. A total of 186 breastfeeding mothers participated in the said event and 170 babies were successfully breastfed. To all the 486 attendees, this is another fruitful year of sharing and gathering for a beautiful purpose. Let’s all help in spreading the advocacy “Ibalik sa uso ang pagpapasuso”. 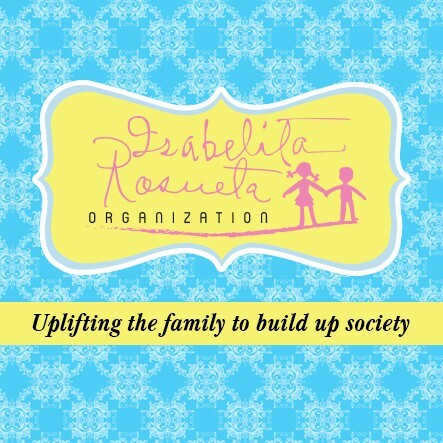 IROG (Isabelita Rosueta Organization) is a non-profit organization based in Subic Bay, Philippines that aims to bring hope to the community by fostering goodwill and cooperation through scholarship grants, educational activities, livelihood programs, and community-oriented projects.